Was corruption involved in contract awarded to KRW? On August 17 2015, Sheriff Bill Elder announced the release of a report concerning the Organizational Assessment of the El Paso County Sheriff’s Office. This report was completed by KRW associates (KRW), a firm which includes Lorne Kramer, former city manage and chief of police (CSPD), as a key principal. This was suppose to be an independent report with the following goal; “… to conduct an in-depth assessment of the organizational climate and environment in order to offer recommendations to enhance morale, organizational proficiency and leadership.” (page 4). 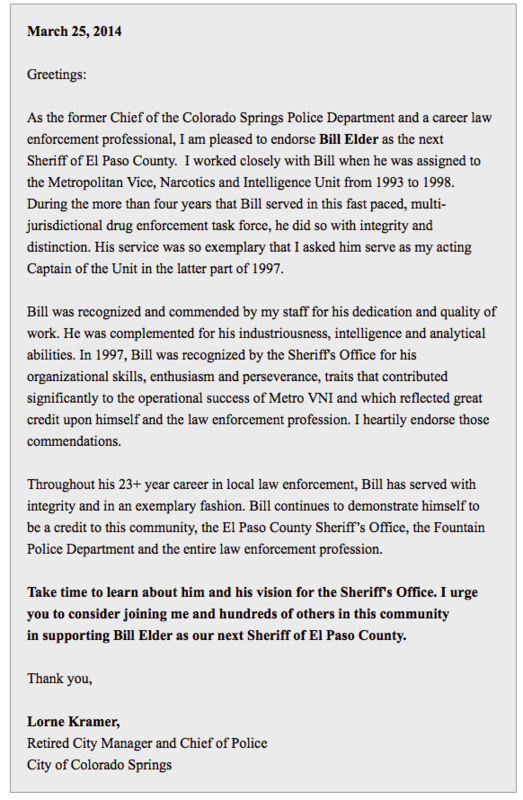 How independent could a report be when the project manager personally endorsed Bill Elder for Sheriff in a written letter? (Read Letter) When the county awarded the contract to KRW did they know of the relationship between Kramer and Elder? This brings up more questions we have been trying to get answers to. According to a Gazette article (Read story) the cost of the report was $55,335. According to county policy 3.98 titled: Professional services over $25,000 states, “A formal RFP is required unless, in the opinion of the Director of Procurement & Contracts, the Director or Manager of the department requesting the service can justify the source as being special or uniquely qualified to provide the service. 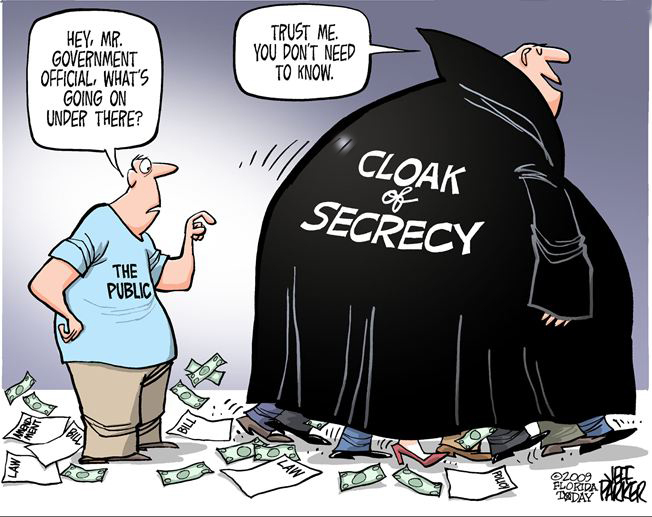 In these instances, written documentation must accompany the request from the department signed by the Director of the Department.” We could not find any evidence that a competitive bid ever took place, or documentation justifying a sole source. If there wasn’t a competitive bid; why would the county commissioners and the county budget office allow this to happen? Why would the county finance office pay the invoice from KRW? Plus, KRW is not the only firm who provides this type of service, so how could they justify a sole source? A simple Google search will indicate there are many companies who provide this service to include International Association of Chiefs of Police (IACP) and the National Sheriff’s Association (NSA). Was KRW awarded this contract in violation of county policy? Was the awarding of this contract yet another example of Bill Elder “taking care” of his buddies who supported his election campaign? County Policy 3.98 goes on to say; “full documentation of the scope of services, qualifications and experience of key personnel, project approach, references, financial information and fee requirements must be in the file.” Bullet 3: “A contract between the county and provider is required.” It is not clear the requirements of this policy were met which brings to question the integrity of the process and potentially county leadership. A source close to Elder told us Elder personally selected KRW. Did the county attorney and finance director play a part by securing the initial contract for under $25,000.00 (which would not require a competitive bid process) and later add additional funding skirting the county policy? Would this action be illegal? This would be easy to verify; ask the county for a copy of all receipts/invoices/documents concerning the KRW contract with EPSO in 2015. Did the county pay KRW 55k and is there documentation supporting either a competitive bid or sole source? The county should be able to quickly answer these simple questions and provide supporting documentation. Elder promised to follow all policies; Is this yet another example of Elder breaking that promise and potentially even the law? 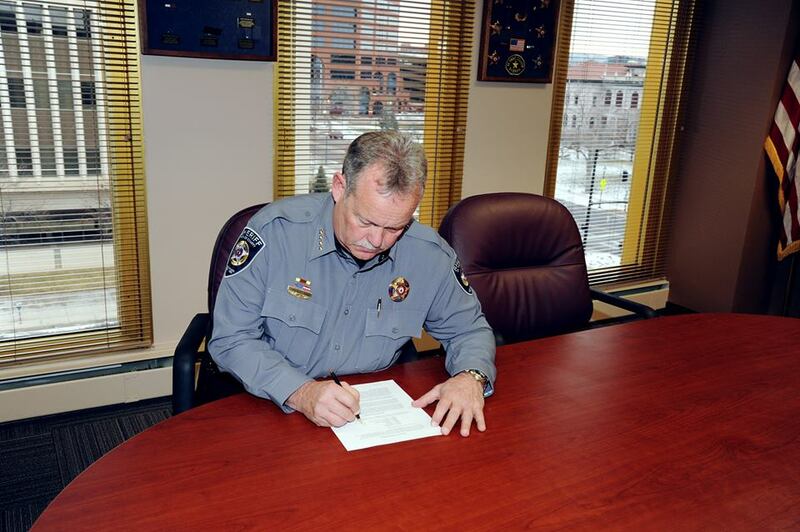 Let’s not forget the picture of him signing the policy saying all policies apply to everyone to include the sheriff. Was the contract to write this report nothing more than a “payback” to a campaign supporter? Was this report even taken serious by Bill Elder? According to the gazette article; “Elder said he expects to complete the report’s suggested items in about 18 months, including about 20 percent of them by September. About half of the recommendations, he said, will be achieved by the end of the year”. It’s been over 18 months. According to our sources very little has changed and only now after this website has brought light to these issues is Elder scrambling to start implementing recommendations in the report. Another recommendation was to clarify and define the disciplinary process. Recently Elder admitted the process he put in place was fatally flawed and would be rewritten (Read story). But he never addresses the five sworn personnel that were terminated under this flawed process. Do they have potential lawsuits for lack of due process? Were they all given an opportunity to address their cases with the Sheriff which is required by state law (Read law)? It’s our understanding the sheriff did not even bother to review the facts of each termination. We were told by one source Elder specifically told one individual he was not informed of the facts concerning his termination and would not intervene with the decision of the Disciplinary Action Board (DAB). 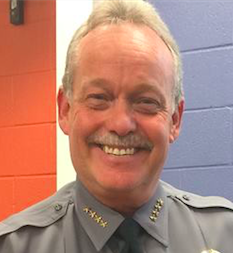 Shouldn’t the sheriff be knowledgeable why someone who works for him is being terminated? Does this sound like the sheriff was following the spirit of the law? A source close to Elder told us the updated DAB policy is nearly ready to be released and will include a review process by the Sheriff. So, again, what about the five individuals who were terminated previously? If you admit you did something wrong shouldn’t you correct it? Would that show integrity? What will Elder do? It appears Elder has only addressed one recommendation in the report; to bid out the food service contract. According to a couple articles in the CS Independent that has not gone well. Read both stories (Read Story 1 , Read Story 2). Can El Paso County provide documented proof that a competitive bid process was used in the awarding of this contract? Was this report nothing more than a way for Bill Elder to financially reward another campaign supporter? Yet another pay for play by Elder? Did county personnel violate county policy by awarding the contract to KRW? Did Bill Elder violate policy and state law? Is this yet another example of corruption in the El Paso County Sheriff’s Office and potentially in the county administration? Should an independent investigation be conducted concerning the inappropriate use of taxpayer money?